I absolutely grinned my way through this story! There are so many touchpoints here to the canon, which were so much fun to discover (and I'm quite certain there are more nods which I missed--but those are discoveries for the inevitable second read!). Many of the one hundred 221B stories within are accompanied by illustrations by Caroline Jennings--and those are an absolute delight as well, charmingly capturing bits and pieces of John Watson's sketchbook, both the innocent drawings, and the ones which belie his fascinating with his roommate, one Sherlock Holmes. 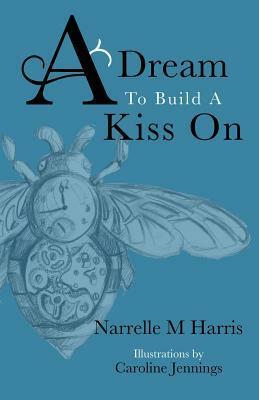 Narrelle Harris' characterization is deft, and her characters are vivid and come to life so quickly on the page! I found myself quickly invested in John and Sherlock and their varied idiosyncrasies, and was absolutely cheering for them to just /see/ the other person--and the way the romance storyline unfolds is charming, and an absolute delight to read. In addition to the multiple POV characters, A Dream to Build a Kiss On also takes advantage of different styles of writing, including personal journal entries and text message exchanges. All in all, I had such a fun time reading this, and will be reading more of Narrelle Harris' work in future. Sign into Goodreads to see if any of your friends have read A Dream to Build a Kiss on.